Workers at Zhangjiang Socks Manufacturing Co., Ltd. in Zhejiang province's town of Datang, which is known as the "sock capital" of the world, in February 2009. Zhou Tingting considers herself lucky to have a job when 20 million of her fellow migrant workers throughout China have lost theirs during the current economic crisis. When the 24-year-old Anhui native went home for Spring Festival in January this year, she learned that many other villagers who made a living in Guangdong province had lost their jobs. She still had the good fortune to retain her livelihood and her salary. That is because Zhou works in Zhejiang province's town of Datang, the so-called "sock capital" of the world. For the past two decades, Datang - also known as the "home of socks" - has produced an annual 13.5 billion pairs of socks, enough to provide two pairs of socks for every individual in the world. 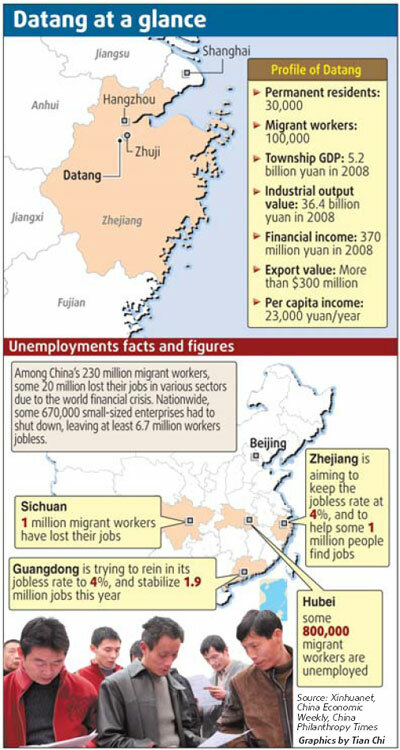 In 2008, the town's industrial output value was 36.4 billion yuan ($5.3 billion). Datang is coping with the current economic downturn by focusing on the fast-developing domestic market as a way to balance the shrinking overseas market. Accordingly, some local enterprises have been recruiting more manpower rather than firing workers this year. "The economic crisis has affected the industry in some ways, especially in terms of exports. But overall, the impact is not too widespread here," said Datang Communist Party Secretary Yuan Zhigang. "The two main reasons are: Socks are a common consumer product that people use everyday. There is still a big market demand despite the financial crisis," Yuan said. "Another reason is the industry is labor intensive, so Asian countries can certainly meet that requirement," he added. One of the smaller manufacturers, Zhejiang Dongfangyuan Knitting Co., Ltd. has not only managed to stay afloat during the financial crisis but is going to hire 30 more workers this year. Its president, Cai Rudong, has made some clever adjustments. When the US dollar began to drop two years ago, he began to use Chinese currency rather than the US dollar for settling accounts with his foreign customers. Last year, he adjusted his production to 60 per cent for the domestic market, and 40 per cent for export. "Strengthening sales in the domestic market is a good strategy for reducing the impact of the economic crisis," he explained. Cai has a design team that offers a variety of designs to keep pace with the latest fashions. "Improving the design is key for getting a niche in the increasingly competitive domestic market," he added. Although the economic crises has not impacted the sock industry, some larger enterprises have felt increasing financial pressures since last October due to investments in other fields, according to Yuan. "These enterprises not only manufacture socks, but have also invested in real estate or other projects. Also, the price of raw materials has dropped sharply. So, the longer these enterprises keep inventory, the more money they will lose," Yuan explained. To help them over this hurdle, local governments are encouraging banks to extend loans to these enterprises, he said. The largest of these enterprises is Zhangjiang Socks Manufacturing Co., Ltd. (ZSMCL), where Zhou Tingting and 800 others are employed. General Manager Zhao Wenjun said that in his 20 years in the industry, he has not encountered such a serious economic crisis. "Last year, I was worried about the shortage of labor. This year I am anxious about orders from abroad," he said. Currently, the company has received enough orders for March and April, but Zhao is not sure what will happen in May and June, when the global economy is supposed to reach its lowest level, according to economists. ZSMCL's exports last year came to $40 million. Most of its overseas customers are based in the US, including such well-known labels as GoldToe&Moretz and Renfro. Zhao is also worried about what wholesale prices customers will be willing to pay. 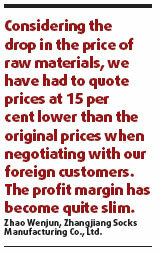 "Considering the drop in the price of raw materials, we have had to quote prices at 15 per cent lower than the original prices when negotiating with our foreign customers. The profit margin has become quite slim," Zhao said. What Zhao fears most is the US imposing duties on Chinese-made goods. The only way to prevent that is to improve the quality of export goods, he stressed. The company has also tried to reduce production costs by raising worker efficiency, Zhao said. In the knitting workshop of ZSMCL, there are fewer workers checking the knitting machines, which hum day and night. "In the past, there were two workers responsible for ten machines, now there is only one," Zhao explained. He denied that the company has fired any workers to cut costs. On the contrary, he said, the company is going to recruit 200 more workers this year to meet the demands of the fast-developing domestic market. "Last year, the domestic market accounted for 30 per cent of our sale. The percentage is sure to increase this year, to balance the decline of the overseas market," according to Yang Siping, who is responsible for the domestic market at ZSMCL. "Whether it is for the domestic or overseas market, 'quality first' is the principle we will never change," Zhao said. The domestic market for socks has boomed as a result and business in Zhejiang Datang Light Textile and Socks City has never been better. Opened in 2002, the 110,000-square-meter build-ing is the town's biggest wholesale market for domestic customers. Its annual volume of business reached 10.2 billion yuan last year, up from 9 billion in 2007. 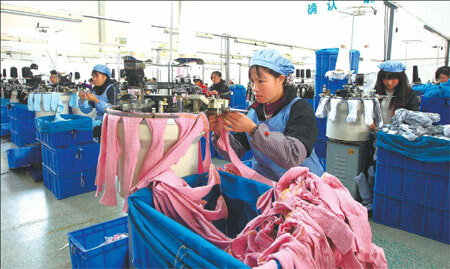 There are more than 600 people operating businesses ranging from light textiles to hosiery machines to socks. "We have been receiving an increasing number of phone inquires asking if there are any booths available in the market," said market director Hou Zhiping. Hou said on the first day the market opened after the Spring Festival holiday this year, there were more than 1,500 customers, an increase of 30 per cent over the same period in 2008. "I think business will be good this year," Hou said. Yuan is equally optimistic. "Many businesses felt stressed at the end of last year. Now we have been through the dark times, I am confident things will get better in the future," he predicted. Datang is a town on the Hangzhou-Jinhua Highway. It was established after the country's economic reforms. At first, it served as a center for the sock trade due to its convenient location. Then local enterprises began to make socks. After more than 20 years of development, Datang not only manufactures socks, but also produces the raw materials and machinery for the production of socks. Datang's native population is 30,000. One out of two households makes a living making socks. The number of migrant workers has reached 100,000. Most come from Anhui, Henan and Yunnan provinces. "Now, I appreciate my job than ever," said one of them, Zhou Tingting.